Near enough to all the action of Kavos - just 500m away - but far enough away that you can sleep off the night before in relative peace, the Kavos Plaza is excellently situated for you to make the most of everything that's on offer. Me And My Mum Went To Kavos in August best time ever loved it. Angela and Dimitri were well amazing didn't want to leave any way was amazing. Rooms were decent sized, air con and safe 60 euros which was a bit high but what can you do would recommend it. Wednesday there was a BBQ costing 12 euros PP which was all you can eat but after one plate I was ready too explode. Brilliant holiday and hotel although the bathrooms are like walking on black ice after someone's been for a shower. Two of us went for week. Overall hotel looks nice and tidy. Rooms quite modern but beds very uncomfortable, a bit dirty shower and sink. "Funny" smell on arrival. Every night disco at pool bar so didn't really try food other than english breakfast, and that was very average. Like someone said already some of staff a bit grumpy.When you decide spend your euros somewhere else. Place pretty quiet until about 6.00 am when drunk kids leave pool bar ( we had this kind of weak up every day: screaming, smashing things against our wall/doors. Owners did nothing about it even there is a penalty 300 euro. ;* We enjoyed our holidays anyway, we stayed in hotel as little as needed. It could be very nice place if well managed. The hotel and staff were amazing (Angela, Dimitris, Evangelos and Dina) im shocked at some of the other reviews complaining but some i think would have been too old to enjoy kavos, complaining about noise etc, there was an older couple there when i was and they complained about noise and other guests but when you go somewehere like kavos you should expect it i would say dont go to the lively part of kavos if your over 30 - 35 and want a quiet holiday. I had the best time ever, met loads of ppl and felt very welcome, the Dj Deano was very funny and made sure everyone got involved if you want partying at nite and chillin in the day this is the place for you, i would recommend Kavos plaza to all my friends. We arrived in October and we thought things were slowing down, so we thought....! This hotel is a poorly advertised as a 2 star quiet retreat from the action of Kavos main strip, however all the rooms are adjacent to the hotel bar and the DJ played music to 4 in the morning and started again at 9am. So if you want to get your head down, you cannot sleep with the patio doors open and you cannot sleep with them closed as too hot. The accommodation itself was basic and the bathroom had a shower like a watering can with a cheap shower curtain. The staff treats you like kids on first holiday, and were keen to ensure you stay in the hotel and drink and eat. We actually moved hotel during our stay, but you will find that every hotel is the same and watch out for the water pressure as you will shower in boiling hot water. If you fancy an endurance test and not a holiday to have fun and chill this might be for you. By the way dont forget to pack toilet paper!!! 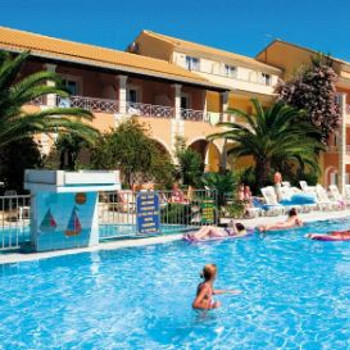 10 of us stayed at the kavos plaza, the holiday was brilliant but the hotel wasn't all up to much. the food was hanging, you have to buy your own toilet roll, the air conditioning is dodgy and the maids clean your room once a week! don't get me wrong the hotel is ok but we stayed in kavos two years ago in the morfeas and that was 10 times better! dina is nice when she wants to be and well jenny who works behind the bar may aswell be called Grumpy! when we told dina about the air con she blamed it on an earthquake! we used to eat out for food for brekky and lunch. we went to the bbq night which was only 13 euros, the food was lush considering in the day it wasn't. the games and stuff was good at the bbq night but we were told there were pool games so we all wore bikinis and then we turned up and everyone was dressed up. overall it was an ok hotel, but you can't beat kavos! Feel pretty bad that I haven't made a more determined effort to review this excellent hotel sooner! The staff were mint!! Hey! where else would the hotel owner attempt to teach you to salsa?? On arrival, it would have been difficult not to feel right at home! The people we met were truly excellent and the fun shared was incomparible to anything I've ever done before. In short - The best holiday I've ever had!!! Kitchenette has microwave, fridge, couple of small portable electric hobs, kettle, utensils and storage. Dressing table and clean bathroom! At the bar there are a lot of drinks to choose from, beers on draught chiller full of other standard drinks and cocktails galore! Home-made food, ranging from traditional Greek style to, well... a burger, soup or omelette. there is a great deal available. Big T.V for films during the day/Karaoke some nights. Proper pool table, Nice big pool, loads loungers!! About 5 minutes walk from main strip where all the bars, clubs and restaurants are (close enough to walk and far enough to relax). Rep was very good at including everyone and notifying all about the days out (of which there were a few). Loads of people came over from other hotels to enjoy the different themed nights at the hotel. Would definitely visit again!! Dina (proprietor) is a great host. Really cheery and a lot of fun! !